Max Flynn is an agent with the British Secret Service. Very little information is available Flynn as the books have been out of print from almost three decades and the author, a very popular British writer names Peter James, has long ago decided that the quality of the books were such that he would not want to see his fans spend their money on inferior works. While there are many series out of print which can be gotten via the used bookstore route, the two volumes in this series are rare enough to command a $200+ price tag, thus remaining in the wish list and not the owned list. "The bang came ... and death descended on me. It was a hot, dark thump ... It was damp and bloody and hurt like hell ... Someone had gone to a lot of trouble to commit suicide". Max Flynn, undercover agent, has the unenviable job of spying on his own side. When to kill, who to kill, whether to kill are all questions which have to be answered at great speed if he wants to stay alive. But who has gone to all this trouble to kill himself? Why does an innocuous airline ticket No 14B matter so much? And could Sumy, his beautiful blonde companion, be a spy? The hazy, murky world of counter espoinage leaves no room for errors of judgement and Flynn knows he's finished if he makes one false move. Terrorists are threatening to sabotage Britain's nuclear power plants. One nuclear explosive smuggled inside a reactor would turn the entire core into a massive atom bomb ... and bring death and disease for centuries to millions. 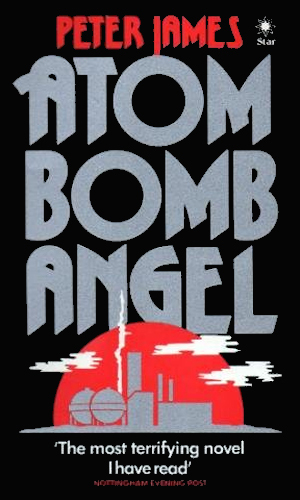 When Sir Isaac Quoit, chairman of the Atomic Energy Authority, disappears without trace, MI5 are alerted to the activities of the mysterious Operation Angel. Slick super spy Max Flynn is briefed to crack the code - but can he beat the deadline before Angel strikes? Who are the terrorists? Why are the KGB involved? What are their aims and which power stations will they sabotage? If he does not act fast, Britain will be engulfed in a nuclear nightmare. Note: A third book, Billionaire was also written by Mr. James during the same time and has also been removed from print by him for the same reason. This novel, however, is a financial thriller and not one of the Max Flynn adventures. Max Flynn is told to go undercover to spy on his fellow British agents, a task he does not want to do. Someone else does not want him doing it and are willing to kill him to make him stop. A plot by terrorists to blow up the nuclear plants in Britain involves the disapperance of the head of that country's atomic energy program. Max Flynn must find him but he has to compete with something or someone called Operation Angel. And then there is the KGB. I had read in an interview with Mr. James that at one point he had not been totally against the idea of releasing these two books in PDF or other electronic format. Whether that was a passing fancy, something he was/is actually considering, or just wishful reading on my part I cannot say. Regardless, I could never justify the kind of money it would take to buy used copies ($200+ is far beyond my sensibilities) so unless Mr. James changes his mind, these two books will have to go into the rarified list of two dozen books in spy series which I do not own. Unless I hit the lottery (doubtful since I do not play but hope springs ...). Mr. James has an incredible talent for creating awesome plots. 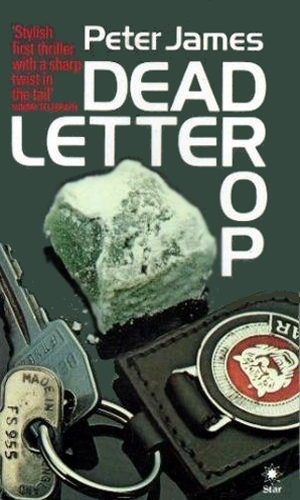 After many years of writing very frightening and thought-provoking (according to reviews I have read) novels in the horror genre, he has recently turned his skills to the police detective story with the dynamite Detective Superintendent Roy Grace. In the first of the Grace books, a man is buried alive by his buddies as a drunken prank, all in good fun, but then they are killed in drunk driving accident. And that is just the beginning. In the next, a man finds a CD on the seat next to him on a train and tries to give it to its rightful owner but ends up seriously dead as a reward and again, that is just the beginning. My favorite snippet I have seen about his books comes from Not Dead Enough, the third book, which goes "On the night Brian Bishop murdered his wife, he was sixty miles away, asleep in bed at the time." How great is that! If you love detective novels, Mr. James is definitely someone you have to have in your collection. That being said, I can both understand Mr. James' reticence in having what he considers inferior work out there with his name on it and I can understand my frustration at having a spy series so definitely out of my reach! If he knew how truly awful some of the books I have had to read for this compendium, he might not feel so badly about his earlier works. Then again, I never read them so I am just guessing. The grade I give is a guess, based on the author's opinion. If you have personal experience with these books, please speak up.